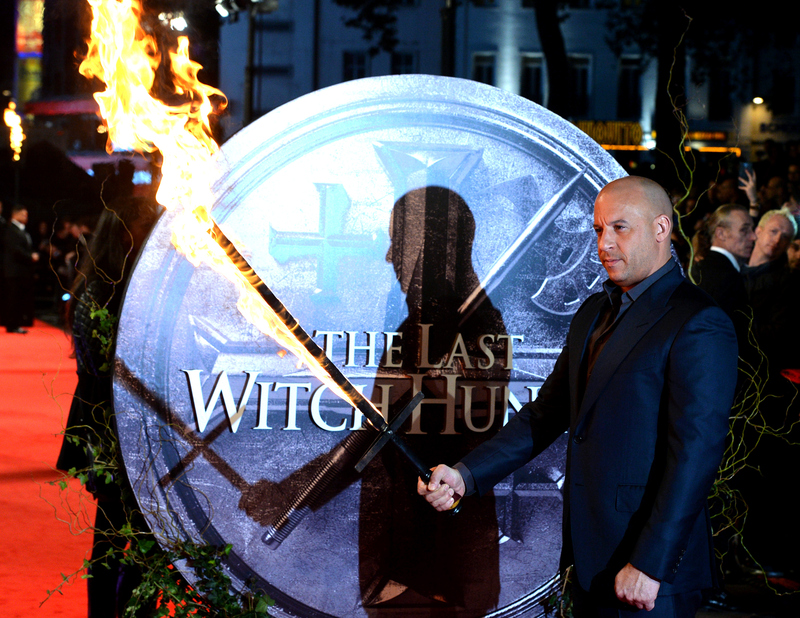 The Last Witch Hunter might be one of the most outlandish films coming out this year. Vin Diesel plays an 800+-year-old warrior cursed to immortality by a witch queen he killed. The witches and Diesel declare an uneasy truce, but one that lasts for centuries — at least, until the witches attack Diesel's friend and companion Michael Caine. He teams up with a priest and a witch, played by Elijah Wood and Rose Leslie, respectively, in order to strike back against the evil witches. (Rose Leslie's witch is a goodie.) Such a fantastic plot seems like it must have emerged fully-fledged from a fantasy-aisle pulp novel, and as though The Last Witch Hunter were based on a book. Yet surprisingly, it's not. The Last Witch Hunter, as Comic Books Resource tells it, was borne of Diesel's personal penchant for a good fantasy adventure. But it's not a book that inspired Diesel — it was a certain popular fantasy role-playing game. The actor and action hero is a notorious Dungeons & Dragons player, and his character in the film, Kaulder, is based in part on one of his preferred characters in the game, a witch hunter who is also an elf. "One of the things about his playing so much Dungeons & ­Dragons is that Vin has a great mind for creating mythology,” director Breck Eisner told Entertainment Weekly. “He understands world building and how that affects an audience." So, absurd as it might sound in theory, in practice, Diesel has constructed a credible fantasy world populated by witches, witch hunters, wizards, and more other-worldly denizens. But let's leave The Last Witch Hunter for a moment and get back to Dungeons and Dragons. Because Diesel didn't make this movie happen on his own — it actually emerged out of a few different coincidental projects. First off, Diesel told ScreenRant that he was asked to write a foreword to the 30th anniversary edition of Dungeons & Dragons. In the foreword, he explains that he played the game religiously in his childhood (and, evidently, still does; just see the above promo "Dungeons & Diesel" for evidence that he's just a very swole dork). He cast himself as a character named Melkor, which he borrowed from J.R.R. Tolkien's posthumous collection The Silmarillion. Shortly after that reminiscence, a mutual friend arranged a meeting between Diesel and a writer named Cory Goodman, who would eventually pen The Last Witch Hunter's screenplay. Goodman was also an avid Dungeons & Dragons fan, and the friend Diesel alludes to in his Screen Rant interview thought their shared love for the game could produce an exciting movie. And so it did — Goodman ended up writing the entire film around Diesel's fictional character, setting the archaic game in a contemporary tone. Diesel described it as "a D&D-influenced genre liv[ing] in a Bond-like cinematic world." In the movie, Diesel is accompanied by fellow fantasy stalwarts Elijah Wood (Lord of the Rings) and Rose Leslie (Game of Thrones), proving just how infectious the genre can be. He told Yahoo that he brought the same role-playing ethos he used to get into Kaulder's head to the table for each subsequent character. "I’m always the guy in the room saying, 'OK, just stop for a second and talk to me like I’m about to play the game,'” he said. His enthusiasm for the project has already spurred not one but two follow-ups; The Last Witch Hunter 2 has already been announced and Yahoo reports that the third has allegedly been confirmed as well. The Dungeon & Dragons tie-in isn't limited to the screenplay, either. Diesel told Yahoo that he hopes there will be a table-top game, and posited that The Last Witch Hunter is "just the introduction to the world." Sure, Dungeons & Dragons has had a staunch subculture fan base, but rarely has it earned such mainstream treatment. Now, all at once, it's received the full big-screen treatment and the star endorsement of a huge action star. While it's not based on a book (it is not, in any way, connected to this Amazon e-romance novel of the same title), The Last Witch Hunter does have strong mythological roots that should appeal to fantasy fans while also doing well at the box office (as any Vin Diesel project is pretty much guaranteed at this point).